How’s this for a recipe for a high-value speaker: Take a highly skilled designer, match him to a company with an audiophile ethos, mix in economy-of-scale manufacturing, and add the cost savings conferred by a company-owned factory in China. Put those ingredients together and you have the new Monitor Audio Silver 300, an astonishing amount of speaker for $2000 per pair. I heard the Silver 300 at the Munich show last year as a pre-production prototype, and was immediately taken by its musicality and blown away by its value. I asked on the spot for review samples. The Silver 300 was designed by Monitor Audio’s Dean Hartley, author of the $29,000 Monitor Audio Platinum PL500 II that I heard sound spectacular a few months earlier at CES (see our interview with Dean in the Designer Roundtable elsewhere in this issue). The Platinum PL500 II was, if not a giant-killer, competitive with speakers approaching six figures. Julie Mullins favorably reviewed the speaker in Issue 268. At that speaker’s CES introduction I had lunch with Dean and Sheldon Ginn of Kevro, Monitor Audio’s North American distributor. During the lunch Dean pulled out a flight case filled with cutaway drivers and explained all the design techniques that went into the new transducers, as well as how the speakers are manufactured in the Monitor Audio-owned-and-operated factory in China. I was greatly impressed that what is essentially a mass-produced speaker had been designed and built with the painstaking attention to performance details that are usually reserved for esoteric high-end models. Monitor Audio’s large global distribution allows the company to bring high-end design to mass-market prices. The four-driver, three-way Silver 300 is the second-to-the-top model in the newly overhauled Silver line. (This is the sixth generation of the long-running Silver series.) The Silver line consists of two bookshelf speakers, three floorstanding models, a center-channel speaker, surround speakers, and a subwoofer. 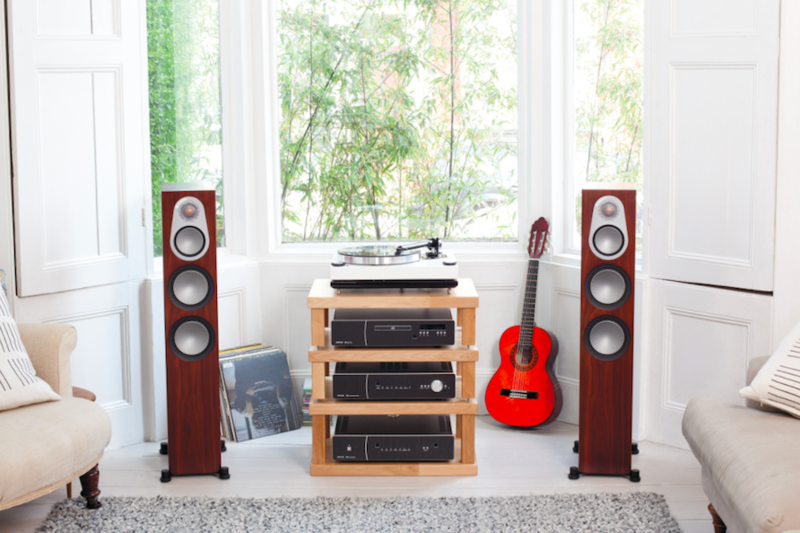 The 300’s slim cabinet is supported by outrigger feet that provide stability as well as the ability to level the speaker. The rubber-coated feet will accept spikes for greater performance. (What are the three words an audiophile should never utter in front of his spouse? “Carpet-piercing spikes.”) Two pairs of binding posts are provided for bi-wiring. Each of the woofers is loaded in a separate ported enclosure, resulting in two rear ports. Monitor Audio says that the Silver 300 was designed to work well in typical rooms where the speaker must be close to the backwall. Foam port plugs are provided to tame excessive bass if necessary (I didn’t need them). The cabinet’s appearance is nothing short of amazing in a $2000-per-pair loudspeaker—it is finished not in vinyl wrap, but in real book-matched wood veneer. This level of finish would be at home on much more expensive speakers. Six veneer options are available including black oak, walnut, rosenut, natural oak, gloss black, and satin white. The upscale vibe is enhanced by the brushed-aluminum plate housing the midrange and tweeter, as well as the magnetically attached grilles with no visible grille- or driver-mounting hardware. Each of the drivers is made using updated versions of Monitor Audio’s C-CAM diaphragms. C-CAM stands for Ceramic-Coated Aluminum/Magnesium, a sandwich material that Monitor says provides high stiffness with low mass. Monitor Audio has been working with metal diaphragms for 30 years; the latest C-CAM design is the culmination of that history. The Silver 300 uses two 6" C-CAM woofers run in parallel, one 4" C-CAM midrange, and a 1" C-CAM tweeter. The midrange and tweeter share a single front plate to bring their acoustic centers closer together. A new motor system features vented magnets and, in the midrange, an under-hung voice coil. (In an under-hung voice coil, the coil is shorter than the magnetic field it moves through. This technique assures that the voice coil remains within the full strength of the magnetic field even at peak excursion. Otherwise, the driver’s motion becomes non-linear with high-level signals as the coil leaves the area of full magnetic strength at the ends of its back-and-forth travel.) The woofers and midrange drivers are dish-shaped, which Monitor says increases diaphragm stiffness compared with conventionally shaped cones that have a hole in the middle through which the voice coil partially protrudes. The gold-dome tweeter is all-new for the Silver 300, and reportedly has as much as 20dB less third-harmonic distortion between 2kHz and 3kHz than its predecessor. All the drivers have higher sensitivity than those in the previous Silver series, making the Silver 300 an easier load for power amplifiers. Sensitivity is highish at 90dB, and the 8-ohm nominal impedance and the 3.5-ohm minimum impedance should allow the Silver 300 to be paired with a wide range of power amplifiers. The woofers cross over to the midrange at 570Hz, and the midrange operates from 570Hz to 3.5kHz. The enclosure design benefits from research done at the National Physical Laboratory in London, where the cabinet was analyzed with a laser-scanning vibrometer. This study allowed Monitor Audio to identify cabinet resonances and then optimize the internal bracing. The laser-scanning vibrometer can detect enclosure displacement in the micrometer range. Enclosure vibration is further reduced by affixing the woofers to the baffle with a single large bolt that runs through the entire cabinet from front to back. In the interview with Dean Hartley in the Loudspeaker Designer Roundtable in this issue, you can see the vibrometer plots in the comparison of the previous-generation Silver series with the new Silver 300. This is a lot of careful engineering and sophisticated technology for any speaker, never mind a full-range floorstander in book-matched wood enclosures that sells for $2000.